This is probably the most exciting blog post you will ever read. Never mind all the insightful, scripture-filled, life-changing inspiration you might find online. I’m here to talk to you about tuna. It’s an important topic and that’s all there is to it. See, here’s the thing. You and I have busy schedules. Some of us love to spend time in the kitchen making nice meals for our families. Some of us don’t. Either way – we all want to be healthy and there are many days each week we need something quick to throw out on the table. For me, this need is most prevalent at lunchtime during our homeschool days. Shoot, right now it’s also very important at dinnertime when we’re running out the door to soccer games. You know what? I need simple meals three times a day, seven days a week. I just do. I’m sure you can relate. I think this little convenience food can be overlooked as an easy meal option. So don’t forget the tuna. Remember the tuna. And now, the most frequently asked questions about this oft forgotten meat choice. Seriously, they are asked frequently. Like all the time. My email inbox is flooded with tuna talk. You have no idea. I add Hain Safflower mayonnaise and homemade pickle relish. Usually I shake in a little salt. How much of each, you ask? Probably 2 Tablespoons of mayo and 2 teaspoons of relish per can of tuna. How many cans do you go through in one meal? Where do you get your tuna? There has been some tuna controversy through the years. Doesn’t tuna have too much mercury? Is it hurting the dolphins? Salted or unsalted? In oil or in water? I’ve researched it. We don’t eat it every day, but I do feel okay eating and serving it every couple of weeks. I order cases of Yellow Fin Tuna from Natural Value. My understanding is that this variety has the lowest amount of mercury. 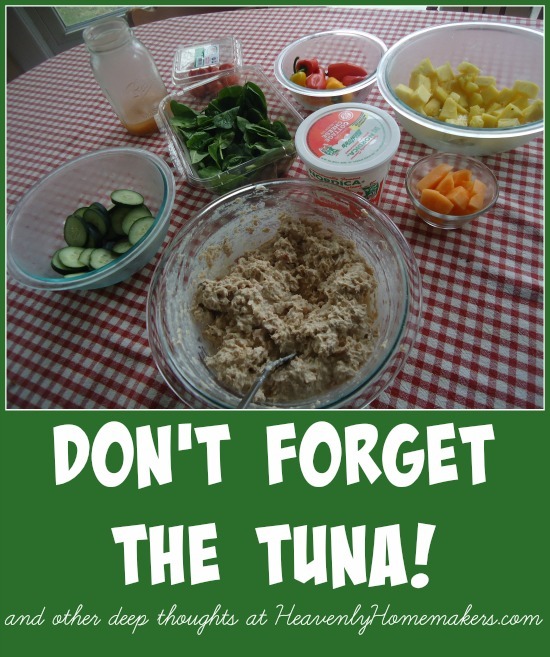 How do you serve your tuna salad? I usually have my boys mix up a big bowl (yay for kids who can do this kind of work so that I can sit around talking like Arnold Schwarzenegger). Then we have it with crackers and whatever fruits and veggies we have in the fridge. It’s also great served on a bed of lettuce and a tomato slice. I like scooping tuna into a big bowl of mixed greens, chopped cucumbers, and diced tomatoes. Or, if we’re really feeling creative (brace yourself for this one), we’ll spread some tuna salad on a slice of bread. We call them sandwiches. Incredible invention. 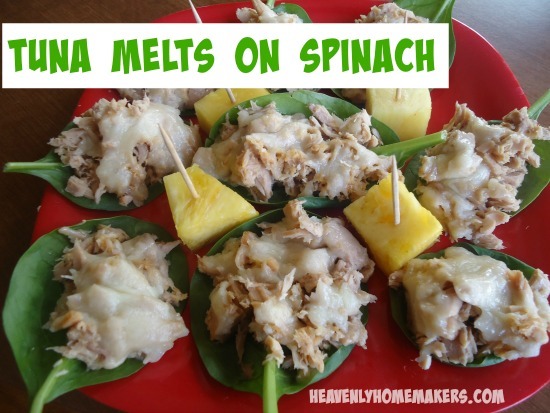 Are you a tuna lover? What’s your favorite way to eat tuna? Join in the tuna talk! I made up a casserole a couple of weeks ago from stuff we had around the house and it was a big hit. Even my husband that doesn’t care much for tuna enjoyed it. I loved how quickly it went together. 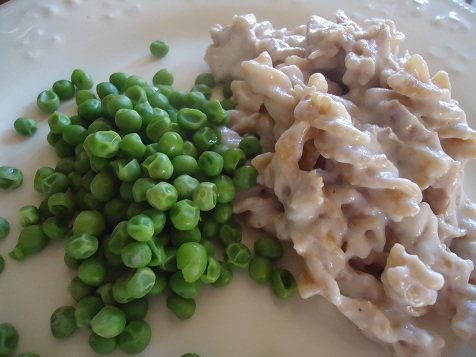 I mixed tuna, cooked brown rice, cheddar cheese, heavy cream, and frozen peas. Topped with crushed Ritz crackers and baked until hot and bubbly. I think buttered bread crumbs would be a great topping too. I made it another time and added dried dill and the family liked that version as well. Thanks for the reminder, I’ll make this again tomorrow night! You and your dill. ;) BUT, your tuna casserole idea sounds great. I never thought about making a tuna casserole with rice. And I’m still sad that you don’t like dill, but we can still be friends. Ha! Yum, that is a great idea!! I followed the link, and its 2.67/can right now on Amazon. Is that a good price for this tuna? I know Amazon prices can fluctuate quite a bit. We are definitely fans here. On crackers, on bread, but my favorite is in a salad with white beans, cucumbers, tomato and a little Italian dressing. Ew, no that is not currently a good price for tuna. I do usually order it through that link, but I wait for the price to go down to $1.50 per can or less. I especially love it when Amazon offers a coupon on this. Sometimes it’s 25% off, plus then I get 15% off with subscribe and save which makes it a great price! We make a pasta dish with tuna. Our local grocery store has a salad bar, so I select things like sliced olives, garbanzo beans, kidney beans, chopped red or green onions, chopped peppers and some cherry tomatoes (if I don’t have tomatoes to dice at home). Then, boil the pasta, while that is cooking, take a large bowl and put all the fresh veggies in, drain a can or two of solid white albacore tuna and chunk up and add to bowl. Add a handful of chopped walnuts and some shredded cheese. We like pepper jack cheese. Drain the pasta, add to the bowl, top with a couple tablespoons of olive oil. Toss, season with fresh ground pepper and serve! We LOVE tuna! However with a family of 10 it’s a splurge for us even with the .69/can tuna from Aldi. We would probably have it more often except that the cheap tuna doesn’t come in lovely chunks like it used to and draining it is MESSY and TIME CONSUMING. Ugh! Do you know any easy tuna draining hacks? I’ve tried the handy little things that you put on the can ( works with chunky, not the shredded ) , Tried paper towels… my fine mess strainer… I always end up having to squeeze it by hand. I’d be so grateful for a solution ! I never really cared for tuna until recently. I think it is because I am not a fan of mayonnaise. I read a suggestion to mix with salsa and it is pretty good like that. I also tried your tuna casserole and enjoyed it. Instead of mayo, try plain yogurt.. That’s how I like my tuna salad. I also add lots of chopped celery and salt free lemon pepper seasoning. Yum! That sounds yummy. I will have to give it a try. Thanks for sharing! Probably my favorite way to eat tuna, during the summer months especially, is to chop up some fresh tomato, onion & cilantro, then drizzle with lemon or lime juice, mix it all up & eat on tortilla chips!! It’s even better if you can let it sit overnight!! We buy the big can from Sam’s (probably with :( mercury) and open it on Monday. We mix in mayo and pickles, onion, salt & pepper. I leave the juice in so it doesn’t dry out. I put a date on the container and put it in the fridge. We eat in on crackers, over pasta, or in a wrap with spinach throughout the week. If my dinner plans fail for some reason, we have it for dinner. You are right, it is easy and filling! If I make the tuna pasta, I will boil chopped onion, celery and shredded carrot with the pasta. Drain it and then mix in the tuna salad. This softens the veggies. My husband also takes it to work. He likes it with homemade Italian dressing, salt and pepper and eats it on Wasa crackers. I just got this for $1.60 a can!!! Woo Hoo, they have the coupon on the site for 25% off. Thats a great deal:) Thanks, Laura!! Sometimes straight out of the can with mustard on top! Mostly as tuna salad though..I do like to put tuna on bread with mustard. I know…. Fun story-I was trying a new recipe for homemade cream of mushroom soup to use in recipes so I made a tuna noodle casserole. The family couldn’t get enough of it, kept going back for more and saying it was the best tuna noodle casserole in the world. As I was cleaning up I saw the unopened cans of tuna on the counter. Apparently my family prefers tuna noodle casserole without the tuna! When my husband Kevin and I were newly weds we had prolific green pepper plants and a very small budget for food. I tried mixing tuna with diced peppers and it still remains one of our favorite ways to make tuna salad. It stretches the tuna. I like to use tri-color peppers so the tuna salad is colorful. My kids love it and with price matching peppers are cheaper. In Albania we would have tuna salad sandwiches with shredded cabbage to add crunch or leafy lettuce.